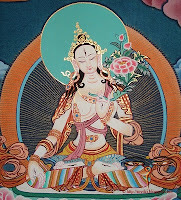 GREEN TARA is represented seated on a lotus-throne, the right leg pendant, with the foot supported by a small lotus, the stem of which is attached to the lotus throne. 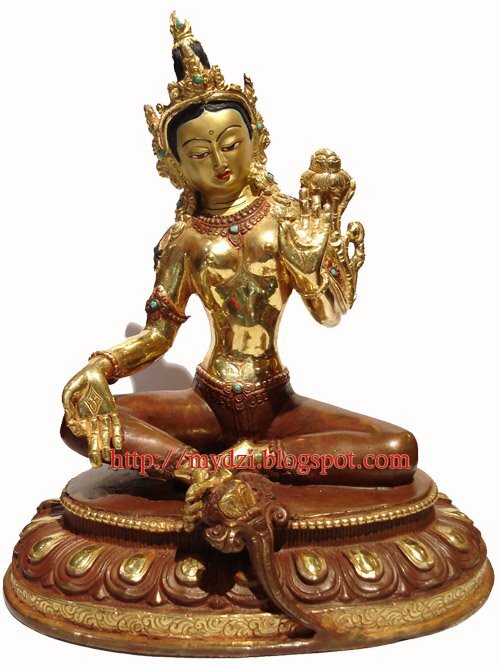 Green Tara is slender, graceful in her pose, and dressed like a Bodhisattva and wears the five-leafed crown. These leaves of crown symbolize five Dhyani-Buddhas. 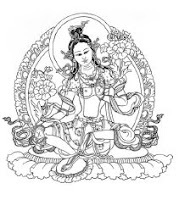 Some time in her crown, the five Dhyani-Buddhas are figured. Her hair is abundant and wavy. Her right hand is in 'charity' mudra, and her left hand is in 'argument' mudra, which holds the lotus. 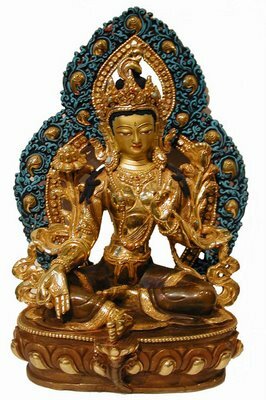 She has two full open eyes, where as her another manifestation; the White Tara (Right Image) has seven meditation [half-closed] eyes. The goddess may also be represented with a small image of Amoghasiddhi [one of the five Dhyani-Buddhas] in her headdress.